@Home This Weekend: Start Your Garden! Posted on 3/29/2019, 9:14 am, by rackycoo, under General Projects. This weekend, enjoy the warmer weather and get a jump on your garden. 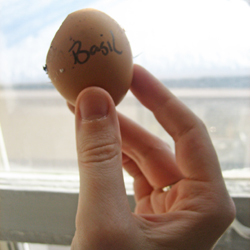 carinbrat posted a great tutorial on how to use eggshells to help germinate tiny seeds. She also talks about transplanting your plants once they’ve grown. Mmmm, fresh herbs from the garden! Posted on 3/27/2019, 12:53 pm, by sweets4ever, under Featured Projects. Every two weeks we pick our favorite 15 projects that Craftster readers have voted for with the “This Rocks!” button. Here are our latest picks which were lovingly and painstakingly chosen (so many amazing projects to choose from! ), this time by kittykill. We hope you enjoy them! Posted on 3/26/2019, 12:20 pm, by kittykill, under General Projects. Are you like me? I lose my keys all the time. Instead of carrying a bulky key chain I decided to try Marieke B.’s tutorial for a Key Cord. This project allows me to scrap bust those last pieces of fabric and I can coordinate my keys cord with my outfits. How awesome is that? A Key Cord can be used to secure items such as a work ID, a phone or other objects that have a tendency to get lost. This is a great craft for someone who is just learning how to sew. It is a fun make and take project for a craft party. Don’t forget your coworkers! 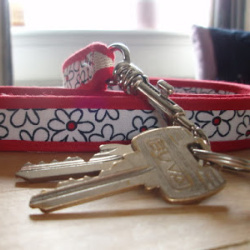 They would love having a key cord as a little thank you gift. Get inspired for your next project by viewing our Tutorial Cloud. Have a crafty Tuesday! Posted on 3/26/2019, 9:24 am, by rackycoo, under General Projects. Sometimes the world can seem a dark place. In times like this, it’s good to look for the light. Positive affirmations help remind us that there’s always some good to be found. 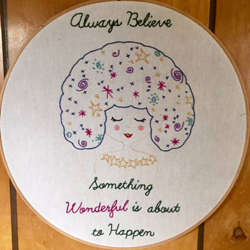 This sweet hoopla by kittykill reminds us all to always believe something wonderful is about to happen. I love the serene look this young woman has. Here’s a big message in a tiny shrine: “be here now”. Acadian Driftwood used a bottle cap to create this inspiring magnet. yzzilnoaj created a series of Rainbow art. Each piece contains a positive affirmation, including “You are made of stardust and wishes and magical things”. 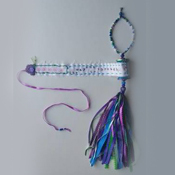 This spool and tassel by craftylittlemonkey is not only beautiful, it contains a secret message. You can unwind it to read a secret message: “the way out is through”. 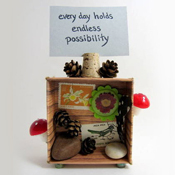 Acadian Driftwood made a sweet little nature shrine that can hold different positive messages. Pictured is “Every day hold endless possibility”. It’s always good to be positive. Having positive affirmations around can help to remind you. 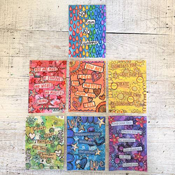 To see more affirmations on Craftster, click here! Posted on 3/25/2019, 3:30 pm, by kittykill, under General Projects, Meatless Monday. Did you know today is National Waffle Day in Sweden? It is! I think every day should be waffle day. Treat yourself to a tasty little snack with momma2many’s recipe for Belgian Waffles. You don’t need a special iron to cook these up. 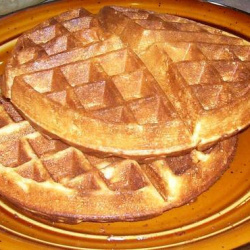 You can make them in your every day waffle iron and freeze them for later. Just pop one in the toaster and away you go! This recipe is a nice base if you want to add fruit, nuts or chocolate chips. It’s a holiday! Go crazy! You don’t need a special day to have a yummy treat. Check out our Cooking Board for a meal that will make your taste buds tingle. Posted on 3/22/2019, 9:30 am, by rackycoo, under General Projects. This weekend, make a welcoming pillow. 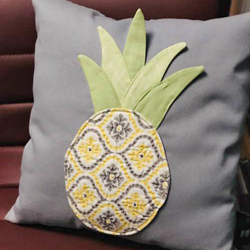 The pineapple is often seen as a symbol of hospitality, so when endymion did a swap with a co-worker, she appliqued a cheery patterned pineapple on the front of the fun pillow she made. Posted on 3/19/2019, 11:28 am, by kittykill, under General Projects. Are you looking for an inexpensive way to update your accessories? 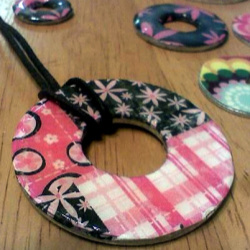 Why not try onescrappinjohnson’s tutorial for a Washer Necklace. This piece of jewelry can be customized to match any outfit. You can design it for both everyday wear or a more elegant event. Don’t stop at making a necklace, use this tutorial to make earrings, a bracelet or a ring for each finger. This project is perfect for a craft night with friends. It will be fun to see what everyone designs. There are so many ways to add pizzazz to your wardrobe. Check out our Jewelry Board for other sassy ideas. Happy crafting! Posted on 3/19/2019, 9:25 am, by rackycoo, under General Projects. Everybody knows you can’t fool Mother Nature, but you can at least craft with her natural objects and make her happy. Here’s some inspiration! 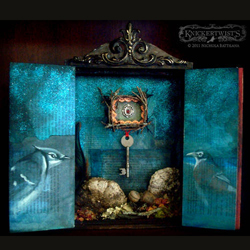 Knickertwist used natural items like acorns and lichen in this gorgeous shrine. The rich colors and her incredible paintings really make this a special piece. 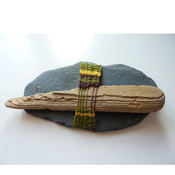 This beautiful weaving by Trekky cleverly incorporates driftwood and slate into the composition. 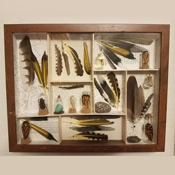 The Raging Sloth collected things on her daily walk in the woods, and compiled them together to make this lovely shadowbox. This small nature shrine by Acadian Driftwood comes complete with interchangeable inspirational quotes about finding beauty around us. 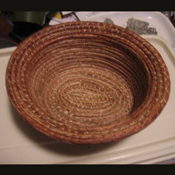 Wow, pinokeeo wove this basket out of pinestraw! It’s hard to believe, but this was her first attempt. It looks like it was made by a pro. Remember that beauty is all around us. Take a look around and get inspired by nature. 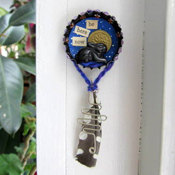 Be a good Craftster and make something beautiful using found objects. Posted on 3/18/2019, 11:14 am, by kittykill, under General Projects. In my neck of the woods when the sun comes out it is a time to rejoice. We celebrate that bright orb in the sky with picnics! There is no need to get fancy when you have an outdoor party. All you need are just a few ingredients for the perfect dish. 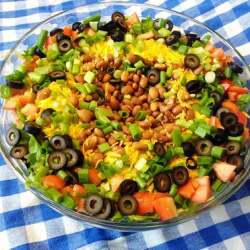 Pinkleo shares her recipe for a Mexican Bean Salad that combines the two essential foods you need for a picnic, salad and chips. This recipe is easy yet tasty. It can be made it a matter of minutes which leaves more time for fun in the sun. Add other flavors, or hotter chips, for more spice to the salad. You can see other seasonal recipes on our Cooking Board. Happy Spring! Posted on 3/15/2019, 7:47 am, by rackycoo, under General Projects. This weekend, enjoy St. Patrick’s Day! 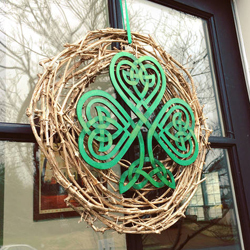 Mistress Jennie made this awesome wreath featuring a Celtic knot shamrock. All her neighbors will know she’s celebrating. Cheers! Posted on 3/13/2019, 10:28 am, by sweets4ever, under Featured Projects. Every two weeks we pick our favorite 15 projects that Craftster readers have voted for with the “This Rocks!” button. Here are our latest picks which were lovingly and painstakingly chosen (so many amazing projects to choose from! ), this time by rackycoo. We hope you enjoy them! Posted on 3/12/2019, 12:09 pm, by kittykill, under General Projects. Yahoo! The sun is finally out! It is time to update your wardrobe. Put those bulky sweaters away and start sporting a fun short-sleeve shirt. Joanita shares her tutorial for a Wrap Front Top that is a sassy addition to your spring and summer attire. A Wrap Front Top may seem like a challenge to sew but you are up for it! You create the pattern so it can be adjusted for any size. Celebrate the new season with tutorials from our Clothing Board. Your outfit will brighten not just your day but everyone around you too. Happy Tute Tuesday! Posted on 3/12/2019, 9:13 am, by rackycoo, under General Projects. So, you weren’t born into a royal family, but that certainly doesn’t mean you shouldn’t wear have a crown. You know you deserve it; you’re fabulous. Crown yourself, and show everyone you know your worth. 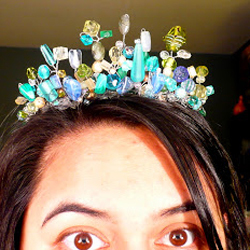 Nooo crowned herself a mermaid with this gorgeous crown beaded in the colors of the sea. 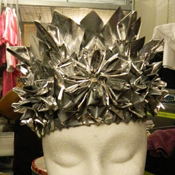 Can you believe this beautiful silver crown is made from duct tape? mtthao9 folded the tape into Kanzashi flowers to make this opulent headgear. Perhaps you would not be a benevolent queen. 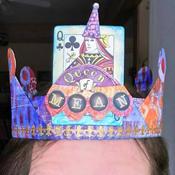 You might enjoy sporting a “Queen of Mean” paper crown. luckydog made this crown for her friend, who was given the title by one of her students. 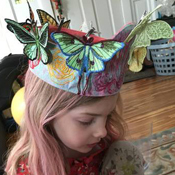 thanate stitched up a sweet butterfly crown for her little princess. What a special way to celebrate a 6th birthday! One fun thing about Christmas crackers is that they always come with paper crowns. Unfortunately, those crowns often tear easily. 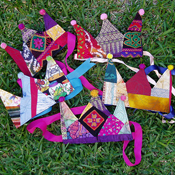 Phizzychick solved this problem by making everyone in her family fabric crowns so they can be royal all season long! Now, let’s all be royals. Let’s live that fantasy. Posted on 3/11/2019, 11:21 am, by kittykill, under General Projects. Have you heard the old expression that breakfast is the most important meal of the day. While that may be a myth, there is no way that you can resist a Spinach Feta Breakfast Quiche first thing in the morning. EerieNoodles shares their recipe for this dish that is both delicious and easy to make. Don’t stop at breakfast! 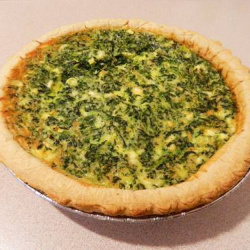 This quiche can be eaten any time of the day. Add other veggies or meat substitutes for a more hearty meal. Make several at one time and freeze them for a quick dinner. Pair this quiche with seasonal fruit and a mimosa for your spring fling brunch. Spring is the perfect time to let go of those old ways and try something new. Our Cooking Board will keep you well fed on your journey. Posted on 3/8/2019, 10:24 am, by rackycoo, under General Projects. This weekend, change the look of a boring old cabinet. 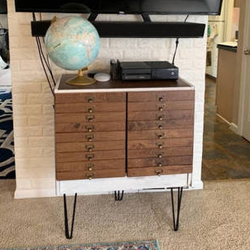 marlie2 totally transformed a thrift store reject into a beautiful piece with new legs and faux map drawers. Visit her post to see this amazing transformation!